As I have written in the past, The New York Times has had a pattern of sensationalizing the status of student loan debt in the country through a series of articles that misrepresent the true status of borrowing. It is a mystery to me why the Times persists in doing so, as they have also published articles that more accurately show the true state of affairs. The most recent misrepresentation appeared last week in an article authored by Kevin Carey, a frequent critic of higher education in this country. 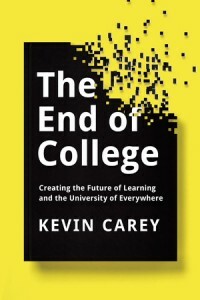 Earlier this year I wrote a critique of Carey’s most recent book, The End of College. In his Times article Carey tells the story of Liz Kelley, a 48-year-old woman who borrowed $26,278 to earn a bachelor’s degree in English in 1994, but whose student loan debt today totals $410,000 – yes, $410,000! As Carey points out, this is a sum of money Ms. Kelley is unlikely to be able to ever pay back given her current career as a teacher at a parochial school. Her total borrowing ballooned because of additional debt she took on for graduate programs (in law, which she didn’t complete, and then education), and the fact that she was infrequently, if at all, actively repaying her loans. The proposition is deeply personal for O’Malley: Aides say he and his wife have already incurred $339,200 in loans to put the two eldest of their four children through universities. . . “Right now, student loan debt is holding us back — student by student, family by family, and as a nation, we have to do better,” O’Malley said during an event at Saint Anselm College in Manchester. Grants and scholarships are critical for helping many students afford college. 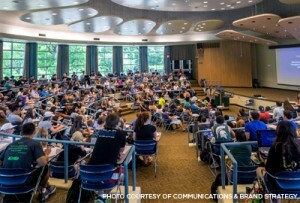 Data from the College Board show that the largest single grant program, the federal government’s Pell Grant program, awarded $33.7 billion to 9.2 million students in the 2013-14 academic year. Without the support of Pell Grants, millions of students across the country would not be able to enroll in college. 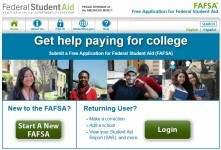 A limitation of Pell Grants for traditional students who are graduating from high school and contemplating attending college, like many other financial aid programs, is that most students do not find out about their eligibility for the grants until late in their senior year in high school. This is often too late for students to take the steps necessary to prepare themselves for college – including preparing academically, financially, and socially – to have an impact on their college going behavior. As I have written in the past, a lot of attention is currently being paid to the topic of student loan debt in the United States (a couple of representative posts can be found here and here). Earlier this year, President Obama proposed to make community college free for all students, motivated at least in part by concerns over the growing volume of student loan debt in the nation. With the 2016 presidential campaign starting to gear up, there are already indications that student loans will be an important topic of debate. 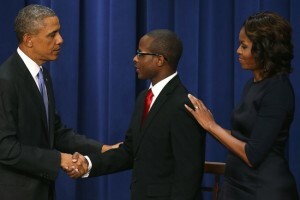 I recently received in my email inbox a request to sign a petition to “forgive all student loan debt” in the country. 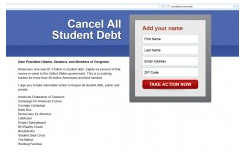 The email did not come from some fringe group that was an offshoot of the Occupy Movement that first started a few years ago, and included as one of its platforms the elimination of all student loan debt. The email came from the American Federation of Teachers, the second-largest teacher union in the country, representing over 1.6 million members. The AFT, in conjunction with other groups, is calling on President Obama and Congress to wipe out all of the existing $1.3 trillion in loan debt held by current and former college students in the nation. 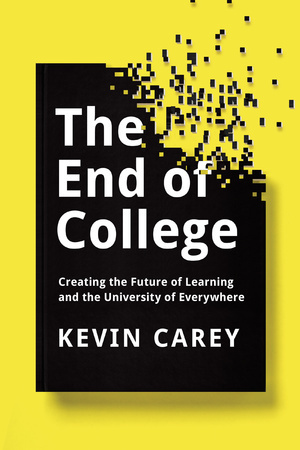 A recently-published book, The End of College: Creating the Future of Learning and the University of Everywhere, by New American educational analyst Kevin Carey, has received a lot of media attention. Carey predicts that most colleges as we know them today will likely disappear, and be replaced by online courses that will be widely and freely available to all students. In an op-ed in The Chronicle of Higher Education, I explained why Carey’s prediction is not likely to come to fruition, and if it did, why it would be bad for the nation. 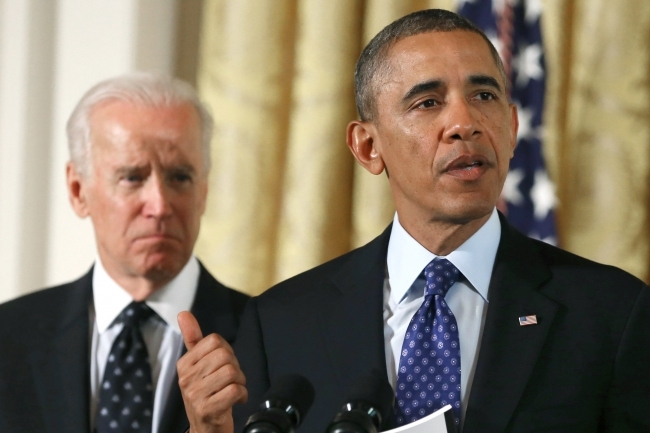 Earlier this month, President Obama began releasing previews of some important proposals he will be making in his State of the Union speech tonight. 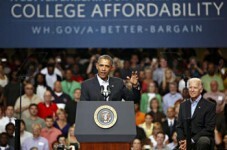 Included is the idea of providing the first two years of community college for free for all students in the country. While this may sound like an intriguing idea, in an op-ed on The Conversation website I explained why this isn’t the best use of federal funds. In the last month, the Department of Education and President Obama have released two important proposals affecting higher education. The first, released by the department last month, was for the long-awaited college ratings plan that the president had first proposed 16 months earlier. This plan would evaluate over 6,000 colleges that participate in the government’s Title IV federal student aid grant and loan programs. President Obama’s more recent policy idea was one he offered up January 9 in Knoxville, Tennessee, where he suggested that the first two years of community college be offered for free to all students in the country. Under the president’s plan, the costs would be covered through a federal-state partnership, where the federal government would pick up 75 percent of the tuition and participating states the remaining 25 percent. The Chronicle of Higher Education website this morning had a feature article titled “The $6 Solution,” which focuses on a college access issue known as “undermatching.” Undermatching is the notion that some high-achieving students, usually those from low-income families, enroll in colleges that are less-selective in admissions and below their potential skill level. The reason undermatching matters, according to those who are researching the phenomenon, is because attending less-selective colleges generally lowers the odds that a low-income student will complete a college degree. Even before this article in the Chronicle, undermatching had received quite a bit of publicity. A front-page article on the phenomenon in The New York Times last March was followed by a piece in the Sunday Review section of the same paper a couple of weeks later. In January, President Obama held a White House Summit on college access, where undermatching was prominently featured (the photo above is from that summit). The White House yesterday announced a new series of proposals to force colleges and universities to do a better job to prevent sexual assaults on campuses, and to do more to support the victims of assaults when they do occur. The proposals came from a high-level task force the president created in January (it contained three cabinet secretaries) to address an issue that has received intense scrutiny both on college campuses, as well as in the media, in the last year or so. A key finding of the task force, as reported in The New York Times, is that, “one in five female college students has been assaulted, but that just 12 percent of such attacks are reported.” As a father with one daughter in college, and a second heading there in the future, these numbers are disturbing. It is clear that we in higher education need to heed the call for reform. In one of my posts on President Obama’s college costs proposals, I described how the president is proposing to link eligibility for federal financial aid to the earnings of the graduates of colleges and universities. The general idea is that only those colleges that produce graduates who earn reasonable salaries should benefit from federal financial aid. 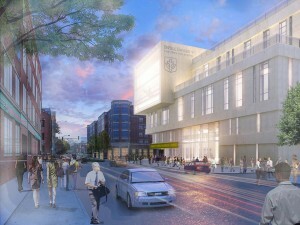 Last week I attended the dedication of the new Theatre School building at DePaul University (shown above), where I am a trustee. The building, designed by renowned architect Cesar Pelli, is a beautiful and functional space. The dedication was a wonderful event that included short performances by students in the acting programs at the Theatre School.